If you have lots of left over basil or are just in the mood to make it, pesto is simple and delicious. It’s easy to make (provided you have a food processor) and freezers really well, so you can enjoy it now or later. 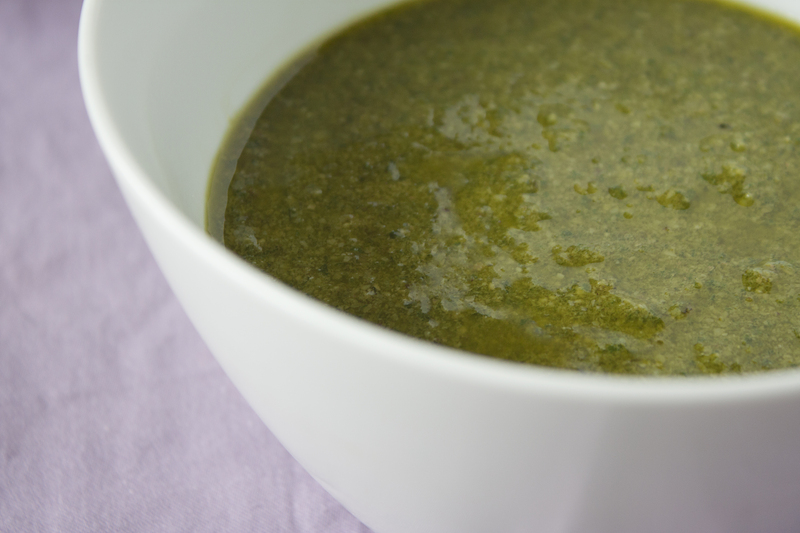 We usually use Ina Garten’s recipe for Pesto and it has never failed to please. We made the pesto most recently this past Saturday when we had our dinner of Heirloom Tomatoes with Goat Cheese and Savory Palmiers. The recipe has basically three steps. First, you briefly process together walnuts, pine nuts, and garlic. Next, you puree the nut/garlic mixture together with LOTS of basil, plus some salt and pepper, while drizzling in the olive oil through the feeder tube of your food processor. The last step is to puree in some Parmesan cheese. You may have to play with the salt and pepper to get the pesto to taste the way you like, but that’s all there is to it. You should use it immediately or freeze it in an airtight container; we use freezer bags with the air carefully pressed out. The pesto will keep for a long time, but we usually finish it up within a few weeks of making it, using it to dress pasta, make more savory palmiers, and even to spice up otherwise boring sandwiches.